Alright ladies and gentlemen. It’s time. The Holidays are just around the corner, and it is time for a full blown schedule packed with Holiday recipes, décor ideas, homemade gifts and cocktail fun! I am going to be posting waaaaay more than usual, like almost every day- so bare with me! It is my favorite time of year, and you are about to see why! So, I am going to start you off nice and slow with an appetizer. I got lots of requests for something light enough to serve before Thanksgiving dinner. Something delicious, just not enough to spoil the main event! So here is an idea. 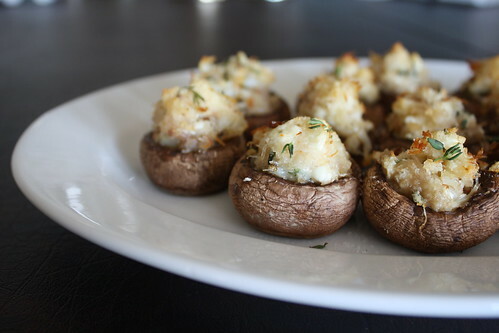 Juicy mushrooms stuffed with goat cheese, crab meat and crispy panko bread crumbs. Wait- that didn’t sound exciting enough! I feel like they need a grander intro, because they are truly, truly delicious. Would it help you to be convinced if you knew I ate about 15 of the 20? And I wasn’t even full. Is that a testament to my oddly inappropriate eating, or to their lightness? I am going to go with their lightness. 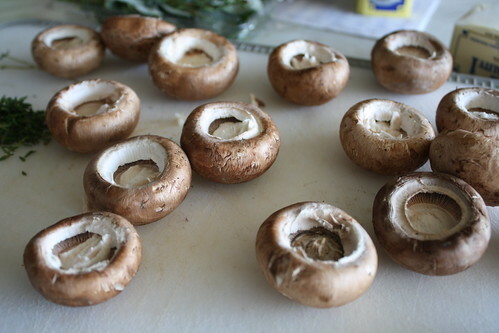 20 crimini or button mushrooms. 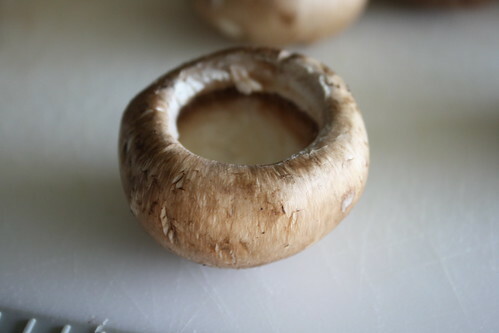 Using a melon baller, scoop out the inside of the mushrooms. 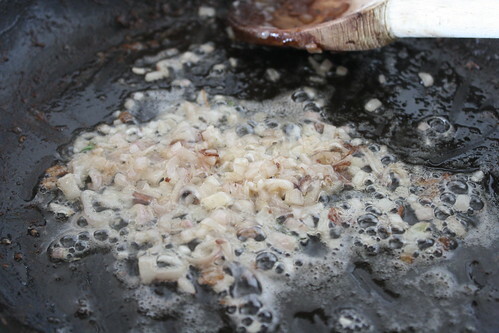 In a small pan, sauté the shallots in the 1 Tbsp of butter until soft, about 2-3 minutes. 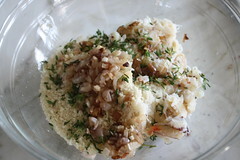 In a medium bowl, gently mix together the crab, panko, goat cheese, and 2 tsp of thyme. 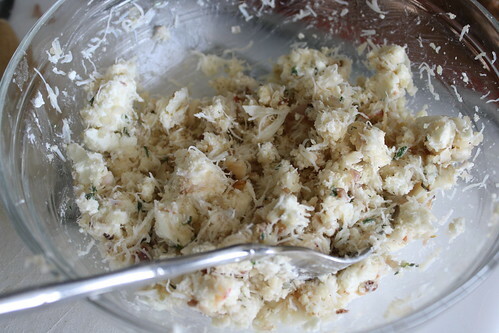 Add the shallots and butter to the mixture and sprinkle with ¼ tsp of salt. Mix well. 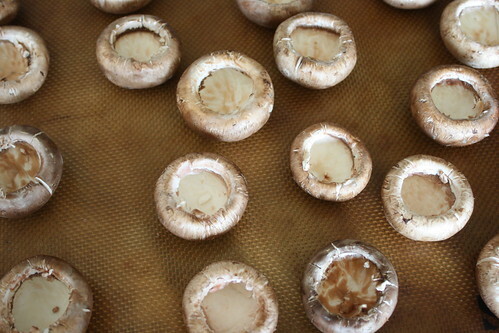 Place the mushrooms on a sheet pan. 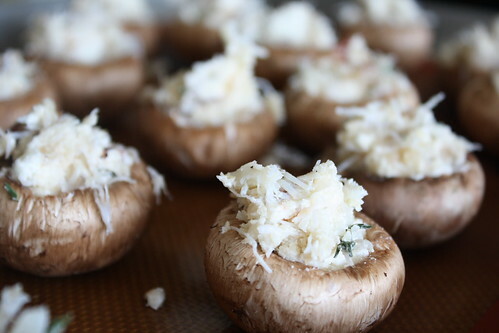 Using a small spoon, evenly distribute the crab mixture into the mushrooms. 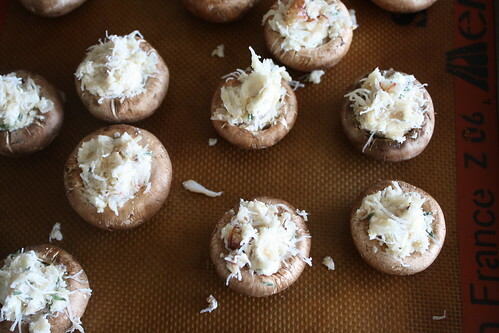 Bake at 350 degrees until the mushrooms are sift and juicy and the topping is golden and bubbly- about 15 minutes. 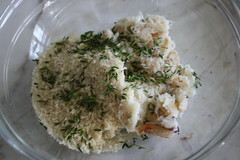 Place on a platter and sprinkle with the last tsp of fresh thyme leaves. Serve hot! 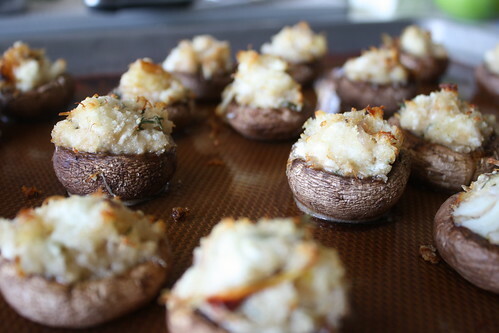 I could just gobble these up right now! Perfect for a party! 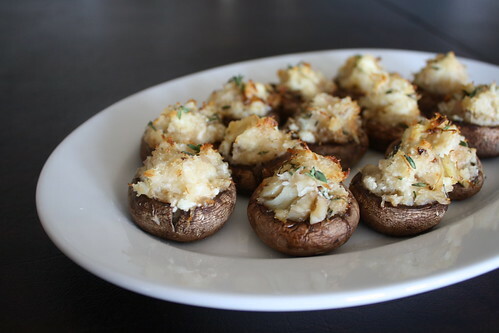 These look tasty and so easy to make! I am bookmarking these for some holiday parties I plan to attend. Mmm! how adorable are these little guys?! Looking forward to daily posts! 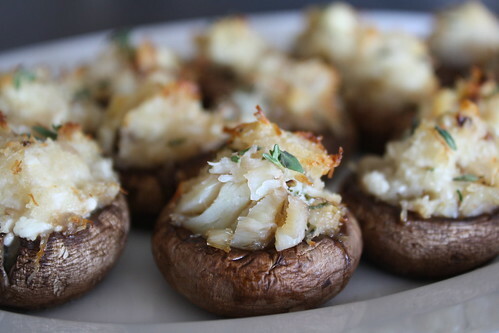 Mushrooms sounds delish! These sound so yummy. 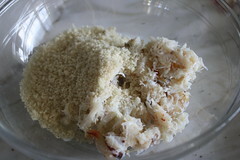 I love the filling recipe you used here. Yum! Thi s is one of my favorite things. Yours look terrific. Come visit us. We have a terrific pumpkin cheesecake today. I have been dying for a pumpkin cheesecake recipe! be right over! 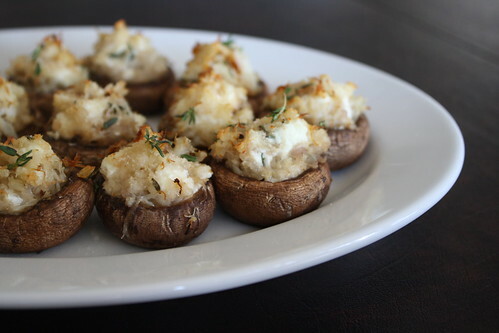 These look delicious and I might just add them to my Thanksgiving menu! 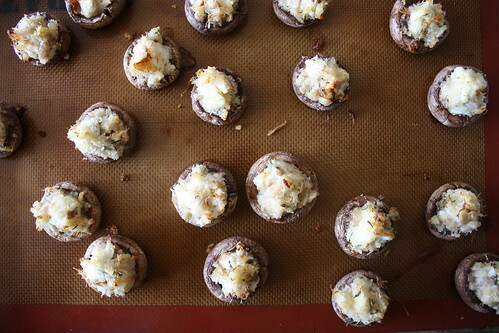 First thing I thought when I saw these: “Perfect holiday party food!” I’m totally making them, such a crowd pleaser. Bookmarked! 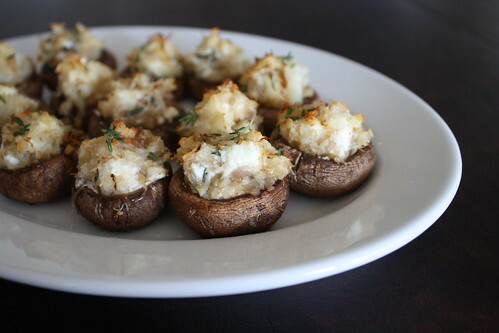 Stuffed mushrooms are one of my all time fav’s – recently been making with shallots, pancetta and sage but these sound heavenly! 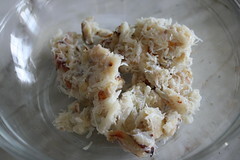 I wrapped them in phyllo dough and brushed with an egg wash to make them a little more delish!